Can anyone guess what I’m making? I’ll give you a hint. I blogged about it here..
After sewing all those original beautiful pieces of grunge together, I wasn’t satisfied with the look of it. It just felt “blah”. I did manage to get everything sewn into a flimsy, but I just couldn’t get the inspiration to quilt it. Then, just by chance, I saw a similar idea that was exactly what I had hoped this quilt would be. Rarely do I purchase patterns, but this one I did. I had to wait a whole 10 days for it to come “snail” mail. Then, I was away for a week. Today was my first free day to start the request (a baby quilt in a modern style) over again. This time I have a pattern, I still have more “grunge” fabric, I have more gray for the background and I now have the desire to put it together and quilt it. Hopefully it will be finished by the end of the weekend. I’ll keep you posted. Piecing is finished for the first set of instructions. When I was cutting my fabrics I didn’t quite have enough of the background batik. I had originally thought I could piece together enough for these blocks, but try as I may I couldn’t eke them out. So I have substituted another batik for the last four 9″ squares. I’m hoping these substitute pieces will be evenly placed in the pattern and therefore not stick out like a sore thumb. When it’s a mystery I guess we just wait and see. A bonus from the cutoff pieces of the Half Flying Geese…. I sewed the cutoff pieces together and came up with 2 pinwheel blocks. Maybe I can incorporate these and the tiny bit of original background fabric that is left into my backing. Yesterday’s quilt was Day is Done. Today’s quilt is Good Morning Sunshine. Good Morning Sunshine is a finally finished wonky log cabin UFO. I love the idea of “wonky” because you don’t have to measure anything. The strips can be cut freehand . Nothing needs to be precise. I even chain pieced the strips onto the 10 1/2″ square flannel foundation. Just like paper piecing except you don’t have to remove the paper. Because it is done on a flannel foundation, no batting will be required when I quilt it. When I was looking for something in my very cluttered sewing room, I came across this little quilting design from someones blog…..I discovered later it was from Cindy Roth back in 2012. I asked you to wish me luck when quilting because feathers and I don’t always get along. It is something I have avoided while machine quilting. Well, I can say for a feather beginner, I didn`t do too badly. The spines are wiggly, the feathers somewhat wonky, but overall it does resemble Cindy`s drawing.. I am pleased with the effort. I haven`t totally mastered feathers yet, but I can do them in all directions and am feeling much more confident. One thing I did do this time was mark the spines onto the quilt. I don`t normally mark my quilts. I`ve always worried about the ink not coming off. I used Mark B Gone. After the completion of each row, I used a piece of wet batting and rubbed it over the blue mark. The ink was easily removed. Because this quilt was pieced onto a flannel foundation, batting wasn`t required. I used a double layer of canary yellow flannel (yes, it will surely wake you up in the morning yellow). If I was doing this again, I think a single layer of flannel would be enough. The quilting design showed up nicely on the plain flannel. So many of my first quilts haven’t been blogged about, so I’m going to try to bring them forward and add my comments. As with many of my quilts, this one was made about 20 years ago, but not quilted until 2015. I have difficulty finding the “right” inspiration for the quilting design. Or maybe it’s that I get sidetracked with a new idea. During my turn on the 2018 New Bloggers Blog Hop, I received many comments on the cursive writing I did on my O Canada quilt. That wasn’t the first time I have written on a quilt. My first attempt at cursive writing was with the quilt above named “Day is Done”. A simple, traditional Roman Stripes block was used to create the main design of this flannel quilt, then a few thin inner borders were added and finally a plaid outer border. Nothing fancy, but I still find it a very striking pattern. I have used the lyrics of a “taps” I sang as a Girl Guide as inspiration to enhance the simplicity of the blocks. Each main block contains a “Setting Sun”. Using my cursive style I have continued the theme by writing the lyrics on a thin inner border around the quilt. The “Setting Sun” motif is repeated around the outer border. I did such a good job of matching the thread colour, you can hardly see the design in the outer border. That’s OK, just knowing the detail is there is fine with me. The quilt is flannel front and back with warm and natural batting…….it is a heavy quilt but perfect to snuggle under when day is done. All the cutting has been completed per directions for the Fireburst Mystery Quilt created by Tish at TishnWonderland. Sewing instructions will be posted soon. I’m excited to get started on this mystery quilt. I have to let you know I am not normally such an organized quilter. Rarely do I cut, bag and label each of the pieces. BUT, I’ve learned when following along with others who have written the pattern, it’s best to be organized so I bag and label. It kept my sanity for one quilt I made. I also admit to buying my fabric before I knew the requirements. Not usually a good thing to do, BUT I found a batik that was my birthstone colours and immediately bought what I thought would be enough. I’m 2″ short on the length. The last 4 5″ squares are going to end up being pieced. Isn’t quilting also called Patchwork? So I’m sure it will be fine. Usually it is only the makers who see the “oops”. Wildest-Dreams from Quilt collector: Miriam Kujac. Finished quilt: 75-1/2″ square. 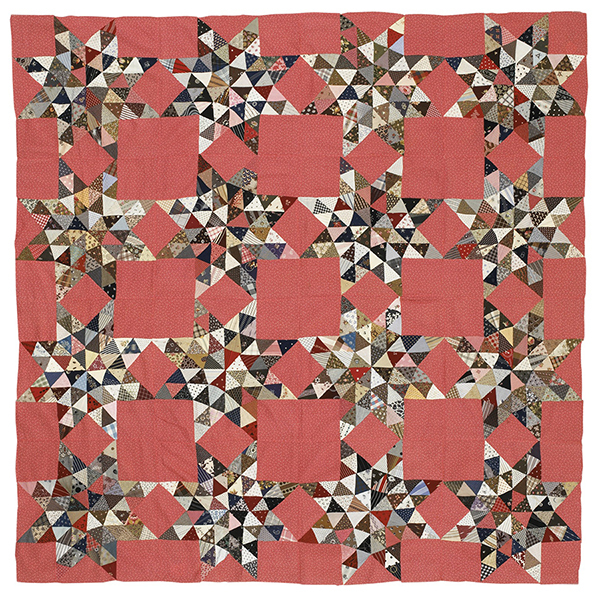 I love how in vintage quilts the makers used double pink or chinese red or mint green as their background colours. Definitely easier to keep clean especially when used as a utility quilt. Definitely adds life to these quilts. I think this is a perfect quilt pattern to use up some scraps. I’ve had my eye on this quilt for some time. Soon, I’m going to do a clean out and sort of my very small studio. I don’t mind cluttered, but it has gone further than that. It’s forced me out onto the dining room table. It will be the perfect time to sort my scraps into colours, then into lights and darks. Perhaps more bins will be required. It’s a very simple pattern…..just triangles sewn together to make larger triangles (watch colour placement). Then two of the larger triangles sewn into diamonds (watch colour placement). Then 8 diamonds sewn into a star (watch colour placement). Finish the block by setting in 4 corner squares. I think the beauty of this quilt pattern is that there is no definite size to the triangles. They just all have to be the same size…say 2 1/2″. Make them fit what you have, that’s what our ancestors did. If you feel you really need a pattern, you can always purchase one here . Art with Fabric Blog Hop starts…..
Now I don’t just surf Pinterest with my morning coffee, I surf blogs as well …..look what I found on Tweety Loves Quilting. Grab a cup of coffee and join the hop. These are the amazing artist that are going to share their creation with us! This quilt if finally being shown in public at the Gwillimbury Quilt Guild Show at the Sharon Temple on June 22, 2018. This is my very first contemporary quilt, made for my sister 12 years ago. It has been used every day since as a “nap” quilt by my brother-in-law. My sister is also a quilter. She and my youngest daughter started me on my quilting journey. My sister is also the one who encourages me to try new things. I found this pattern ………. (I’ll see if I can find the book and insert a link)….. and knew I would make it for her as a Christmas gift. This quilt measures 50″ square. The material I used for both the front and back was faux suede…..very slippery stuff. The construction was interesting. All the 2 1/2″ strips were cut on the bias. These strips were joined together, then folded in half, pressed, and then cut into approx 50″ lengths ….some what like making bias binding. Remember this was back in the days when I didn’t know that bias could be difficult. I just assumed I could do it and I did. Each of these folded bias strips were then sewn to a 1 1/2″ strip of faux suede. Then those joined strips were sewn together. I repeated this until the quilt measured square. The secret to this quilt is that those bias strips can be turned either up or down creating a wavy pattern which is stitched down from top to bottom. Try many different layouts and when decide on your wave pattern then sew it down. The Central Jersey Modern Quilt Guild has organized a Free Motion Quilting QuiltAlong. The idea is to make a machine quilting sampler to further your skills! This block-of-the-month style QAL will be focused on free motion quilting, using free tutorials from talented quilt instructors online. You will “choose your own adventure” to follow quilting tutorials. We will be using Quilt-As-You-Go to join the blocks at the end of the year. This QAL is open to ANYONE, anywhere in the world! The Themes for each month can be found here. I think I’m going to join in on this quiltalong. I know I’m late for the party (that seems to be a habit), but I can always use the inspiration and the practice. I think I can use a very large quilt sandwich on my longarm for these exercises and forgo the sashing. Anyone else up for this challenge?